The Worcester factory was founded at Warmstry House in 1751 by a deed of partnership with 15 members. The period from foundation to 1783, when it was acquired by Thomas Flight, is known as the First Period or the Dr Wall period after one of the original partners, Dr John Wall. Post-Wall, the factory assumed various names and guises until 1862 when it became the Royal Worcester Porcelain Company, a name now owned by The Portmerion Group. 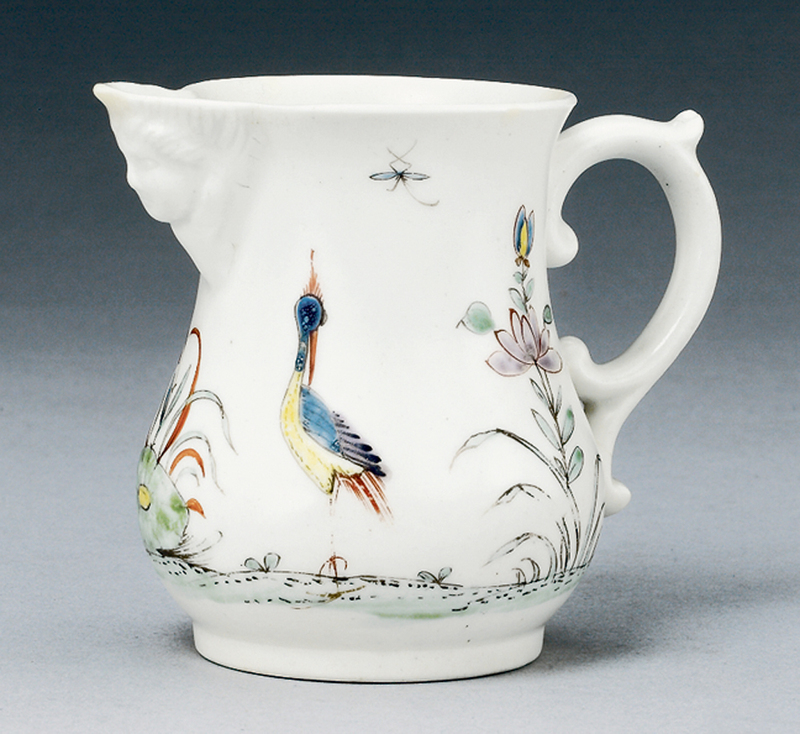 Worcester is the most widely collected of 18th century English porcelain factories. In production for precisely half of the century, it is this long, varied and prolific output that provides collecting opportunities at all levels from the very rare to the surprisingly commonplace. The First Period of production at Worcester is a distinct collecting area with a large base of enthusiasts. 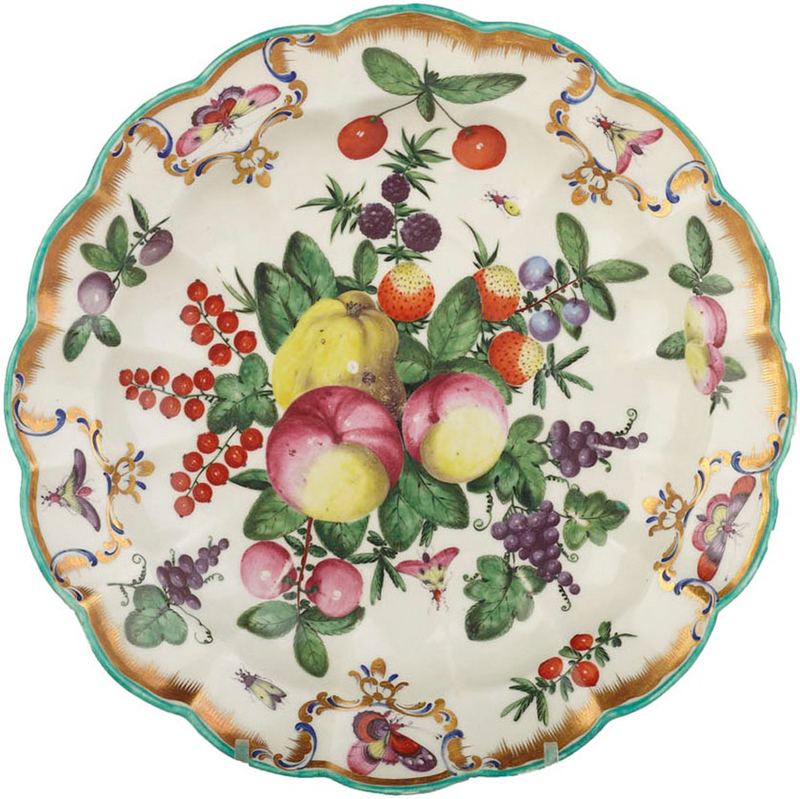 In contrast to the 19th and 20th century when, as Royal Worcester, many figures and ornamental pieces were made, First Period Worcester is predominantly devoted to functional (if sometimes spectacular) tableware. 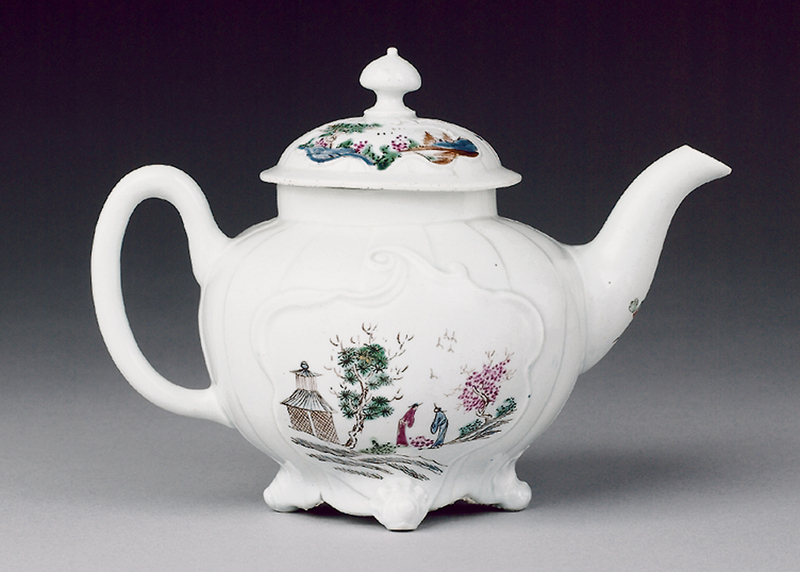 The very earliest wares take their decoration from Chinese and Japanese (kakiemon) porcelain and their forms from silver shapes. 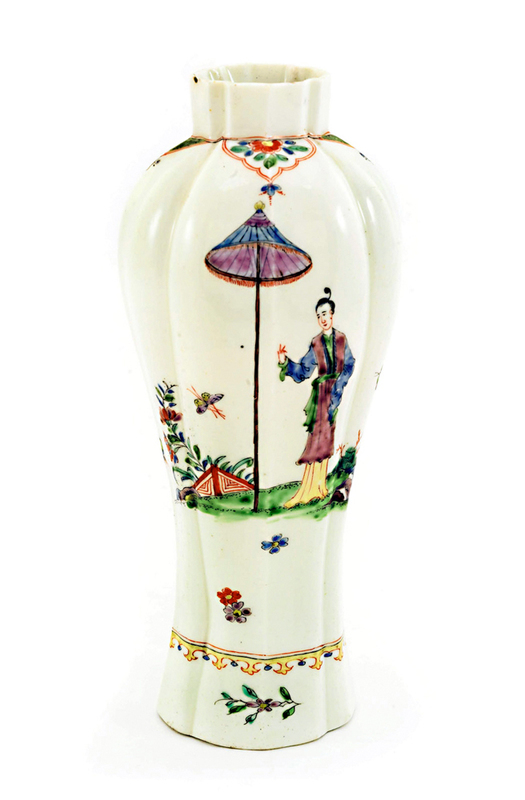 Coloured enamels also predominate over underglaze blue decoration but demand quickly grew for underglaze blue decorated wares painted in imitation of Chinese originals, especially when a new and more durable body was perfected. 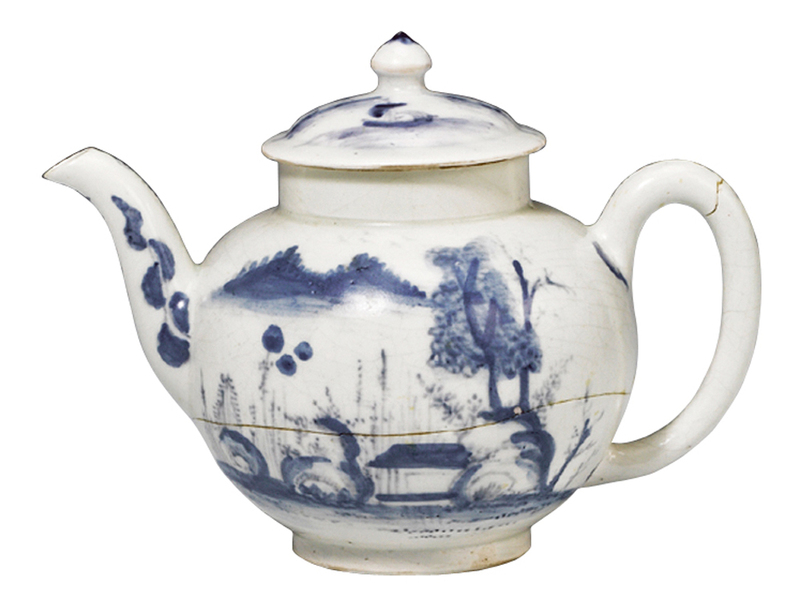 By 1752 Worcester had taken over the short-lived Bristol factory, which ran from 1749-52, and began using the soapstone employed at Bristol as a constituent of its ceramic body, which allowed for resistance to hot liquids. 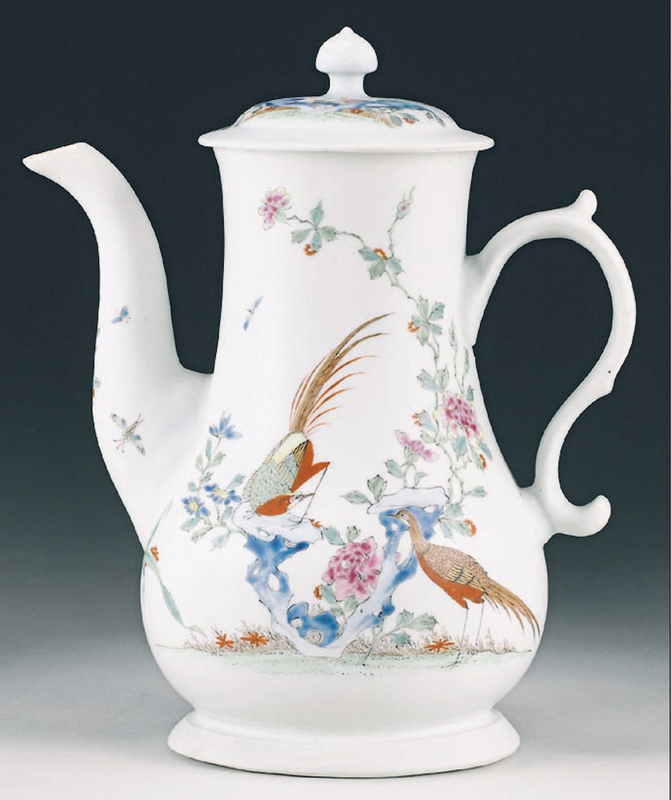 From the mid 1750s, coloured decoration increasingly takes inspiration from European sources, such as Meissen's floral designs. Monochrome decoration in colours such as purple or brown also feature. The factory additionally developed its skills using transfer printing, in underglaze blue, black and puce, but also with an overglaze process using colour and monochrome refined at the factory by Robert Hancock. As well as painted enamels, Worcester also used moulded decoration some of which is derived from Staffordshire saltglaze wares. 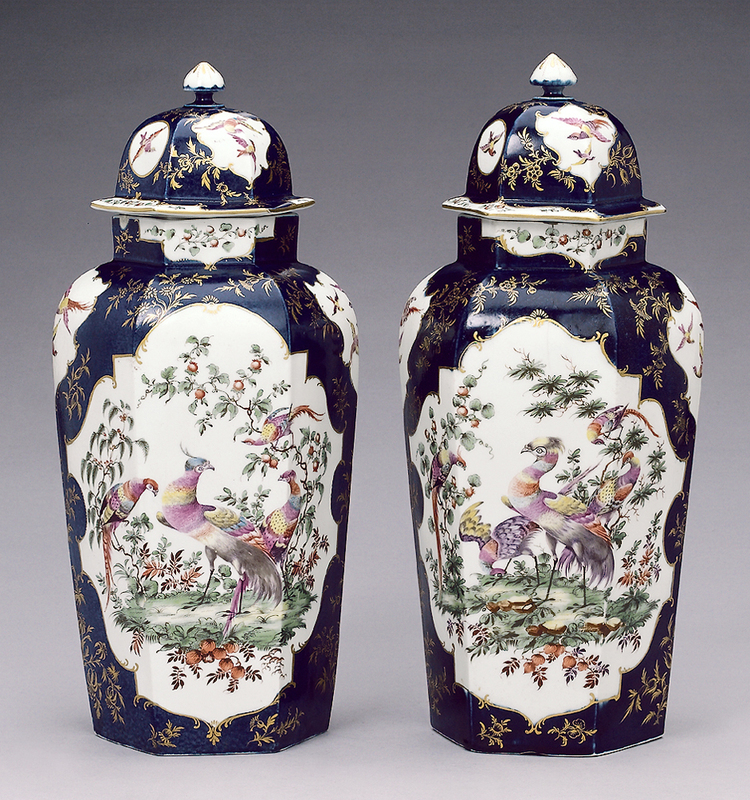 The late 1760s covered vases with rare powder blue ground that led the third sale of the Zorensky collection at Bonhams in February 2006 with a price of £28,000. During the 1760s, lots of decorative innovations come in. 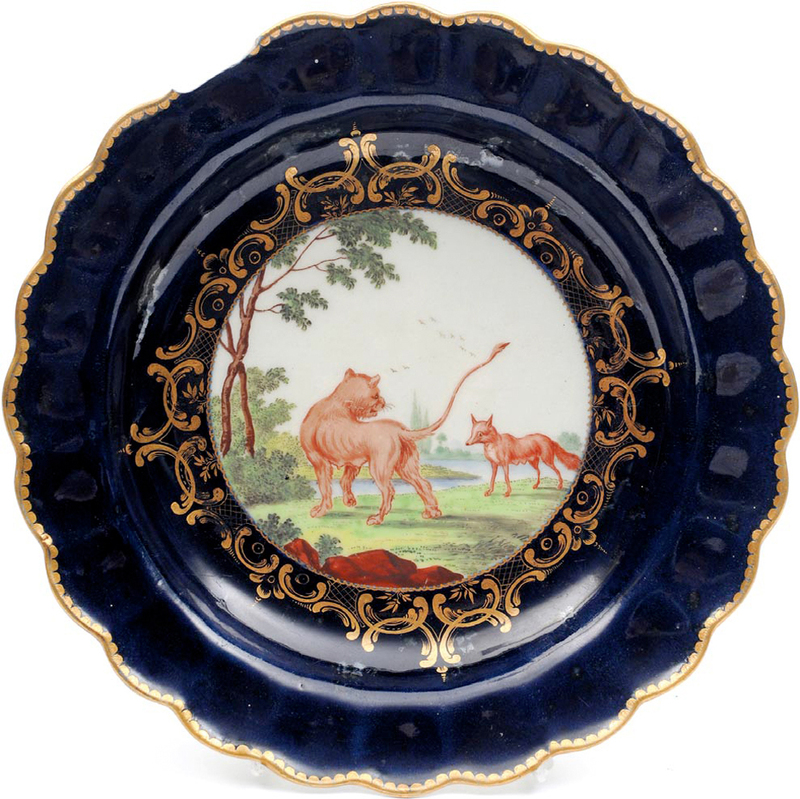 Alongside painted and printed wares, coloured grounds are extensively used in distinctive shades such as yellow and the scale blue grounds derived from Sevres porcelain. Special decorators were employed whose work can be identified and is sometimes signed, like Jefferyes Hamett O'Neale (famous for his scenes from Aesop's Fables) or the sizeable proportion of work sent to be decorated outside the factory in London at the studio of James Giles. By this time, Japanese influence on decoration has morphed from the kakiemon influence of the earliest years into the brightly coloured and richly patterned Imari influenced designs. By the 1770s French rococo influence is much in evidence on Worcester tableware with elaborate grounds on which floral and figural vignettes are painted. The way was being paved for the factory to produce special table services to order for wealthy clients, an important feature of the Flight era. There is also a move towards the more restrained swag decoration and simpler shapes for teawares that herald the neoclassical era. Because there is such a large choice, Worcester collecting ranges widely. It is possible to collect by pattern, by type of decoration or by date. Some people opt only for underglaze blue or printed wares, others aim to amass examples of every pattern that the factory produced. Some buyers collect pieces with commemorative or political decoration or from specially commissioned services. There is a large body of published reference material which helps inform and refine collectors' choices. Collecting Worcester is not just a British preoccupation, it is strong in all English-speaking countries: the USA, Canada and Australia in particular. 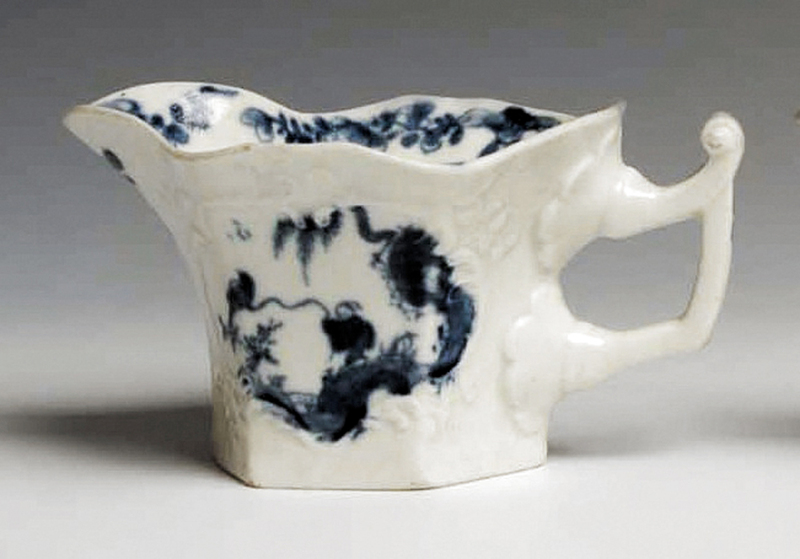 A blue and white creamboat sold by Reeman Dansie in February 2010 for £2300. An example of a desirable simple silver-shaped early piece decorated in underglaze blue with oriental designs. Broadly speaking, Worcester's long production run favours entry-level enthusiasts allowing collections to be formed for a modest outlay from pieces with painted or printed patterns that were produced in greater quantity or those with damage. Prices for routine transfer-printed wares begin as low as £20 but can rise into five figures. Collecting tastes have changed over the years. 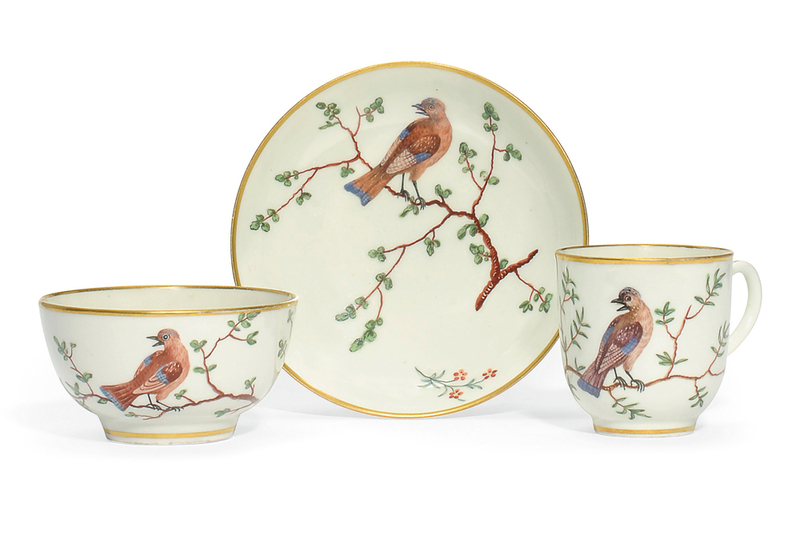 The immediate post-War era saw collectors enthuse over pieces from the 1760s and '70s with coloured grounds like the pierced baskets or teawares with Continental inspired decoration. Many of these collections resurfaced in the 1980s and '90s by which time their star was waning (the catalogues produced at the time by the London dealership Albert Amor make instructive reading on earlier collecting tastes). They can still command substantial sums but, at least in relative terms, these are often well down on those paid by the previous generation of collectors. An exception has been the pieces by Hamett O'Neale or the Giles atelier which continued to perform strongly. Collecting in the last quarter of the 20th century was defined by a re-evaluation and added appreciation of the very earliest products from the beginning of the 1750s. These Chinese-derived wares with their very delicate palette moved to centre stage and today are amongst the most expensive pieces on the market. Buyers looking to acquire rare patterns or shapes are again helped by the extensive literature that charts their availability. These taste changes can be observed by looking at the performance of the collection formed by Americans Milton and Jeanne Zorensky which was dispersed by Bonhams in a landmark auction series between 2004 and 2006. The Zorenskys' aim was to own an example of every pattern produced in Worcester's First Period era. The pieces that may well have been fashionable when they first started collecting were less in demand on their return to the market, while some of the collection's highest prices were for the now desirable early rarities. 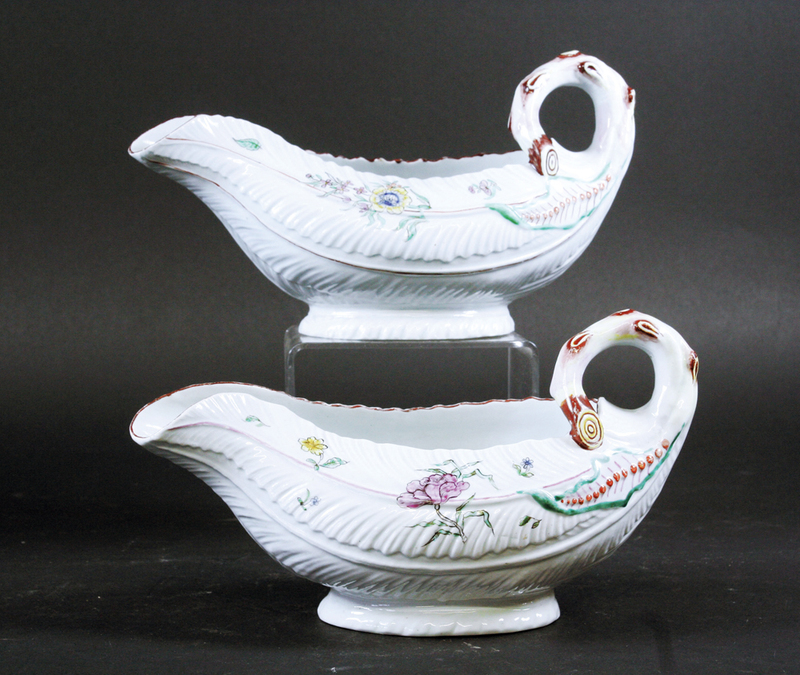 There has also been a definite move towards collecting smaller pieces, like creamboats, teabowls, pickle dishes, a reflection of display space being at a premium for some collectors.